El Color de La Vida. 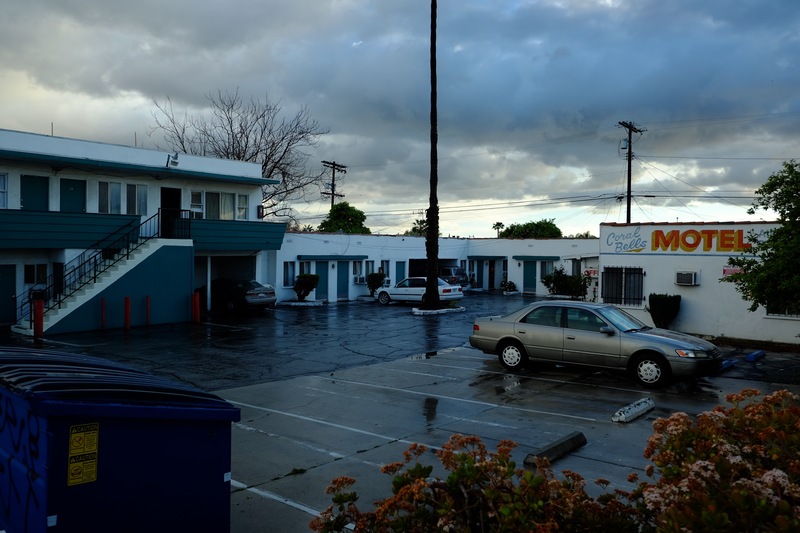 Before the cold rains struck the San Fernando Valley late Monday afternoon, dark and menacing storm clouds went into formation. 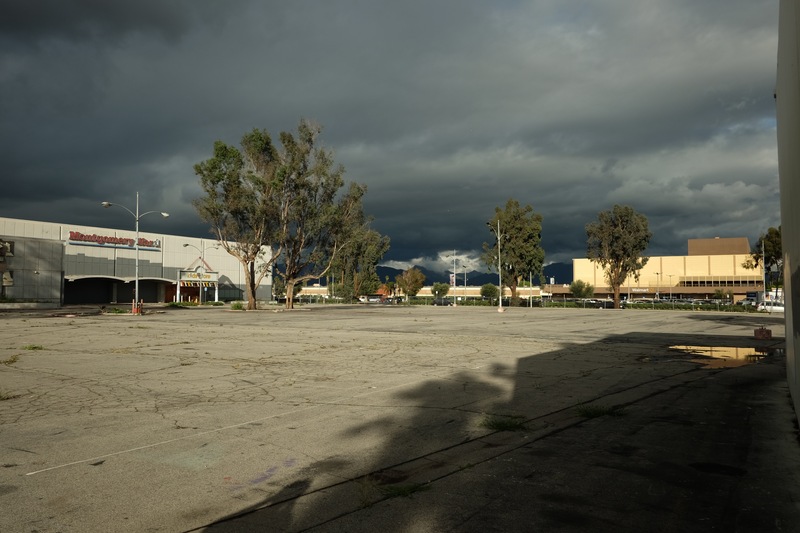 Seen from the empty asphalt of an abandoned parking in Panorama City, the view east lived up to its name. The craggy, inky, rock-topped San Gabriels permitted fog to brush their face. Eager to pursue the dark light show, we drove east on Roscoe where it opens up under the high voltage lines, across the valley, under the concrete freeway, cutting diagonally up Tuxford, emerging into the industrial abattoir of Pacoima where death and life, and light and shadow hunt under smokestacks and behind motels. 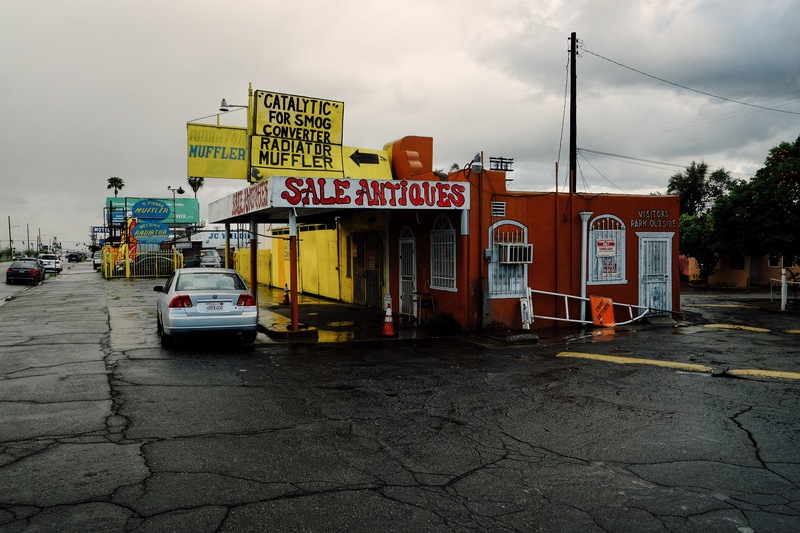 The rains came down on Van Nuys Boulevard and San Fernando Road, soaking Chabelita’s Restaurant, Gallardo’s Auto Repair, Fierro’s Muffler, Franco Tires, JC and Son Welding, and the Coral Bells Motel. And then, in the mode of Los Angeles, the sky cleared. A vast, blue vista opened up. A cold wind followed. Carrying our cameras, we passed men who eyed us with suspicion. Señor Fierro came out of his muffler shop and kindly asked us why we were taking pictures. I handed him my card and told him how beautiful the sky was. He seemed to agree. These people work hard. They come from lands where blood soaks the cross and breaks the heart. Now they weld metal and change tires and cut hair and dig trenches. Here are these Americans whose presence makes us American. 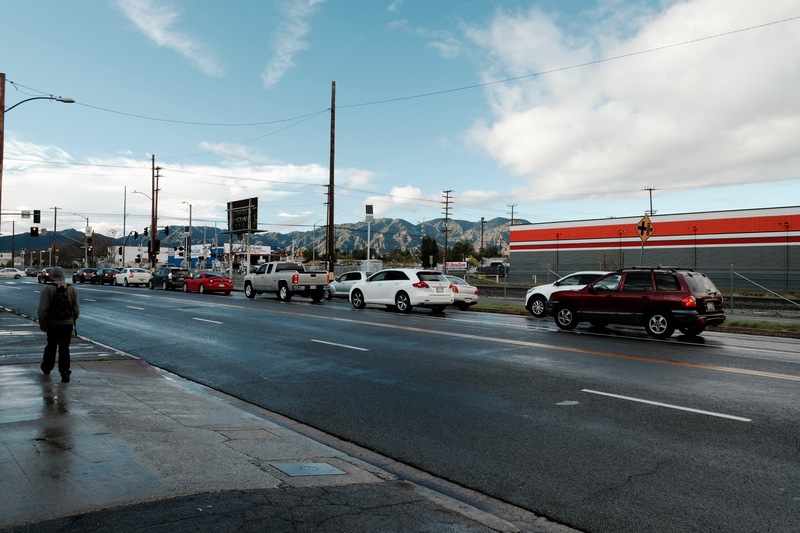 San Fernando Road is also part of Route 66. The historic state sign says so. 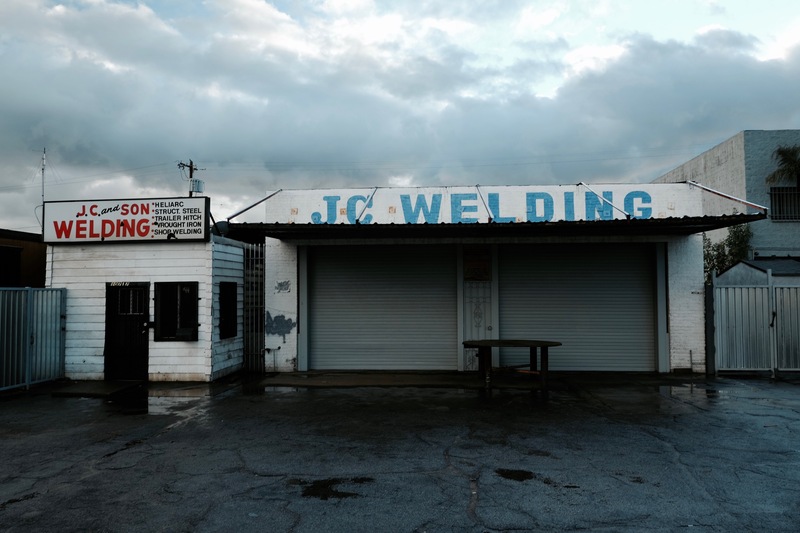 The old motels along the highway attest to a long history of travellers who made their way into California: on foot, by automobile, in the back of trucks, hidden inside freight trains. They got here and slept on the floor, two or three to a bed. Some had no papers. Some had no money. They were somewhere strange and hostile, but free, free to pursue and put down roots and stop running. But death caught some too young. 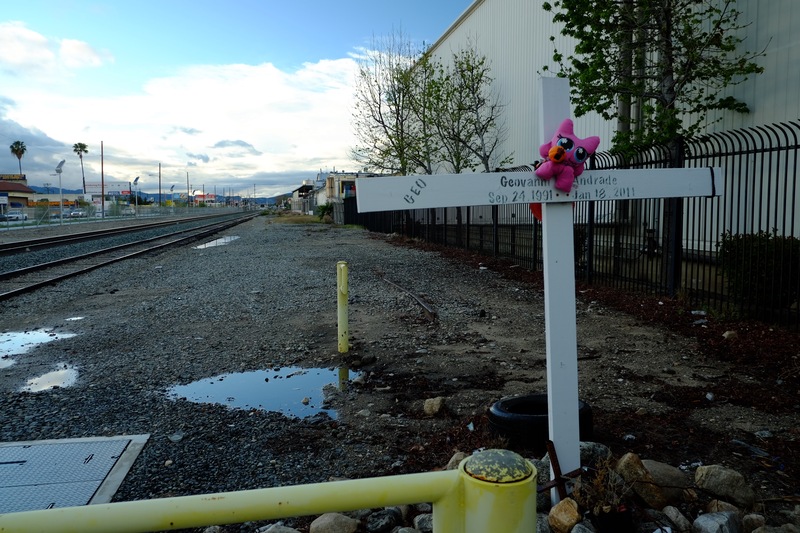 Some died under trains, running across tracks after the signal, or purposely running into death to escape the misery of life. Pacoima is strong. Its buildings are painted in the deepest blues, oranges, yellows, reds and greens. There is no room for ambiguity in hue. The choices are laid out in bright sunlight. The devil and the angel battle here. You can eat well or go hungry. You can get pregnant and high, or go to school and study hard. You can pray or you drive drunk into a wall. Pick the orange off the tree or the prostitute off the street. It’s up to you. 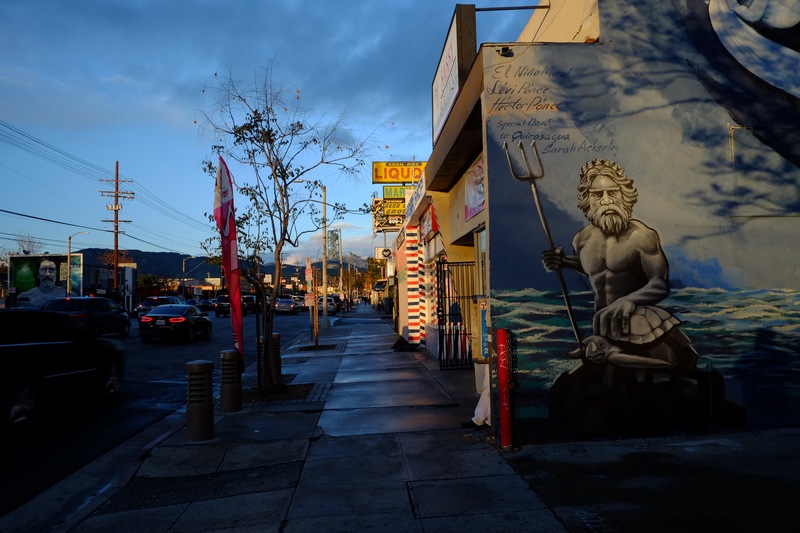 On walls, adjoining muffler shops and liquor stores, are murals of mythological, cultural and aesthetic magnificence. 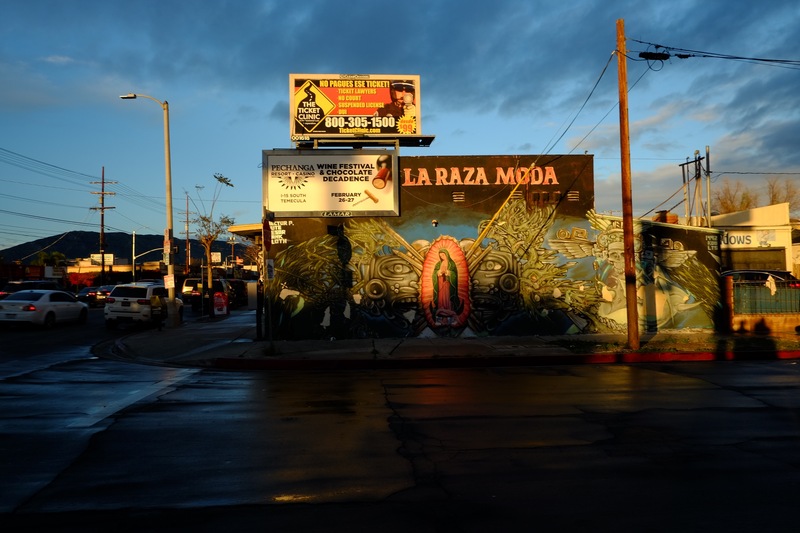 Poor Pacoima has more beautiful public art than Beverly Hills. And there is even a wall-sized portrait of that savior and scoundrel El Niño. 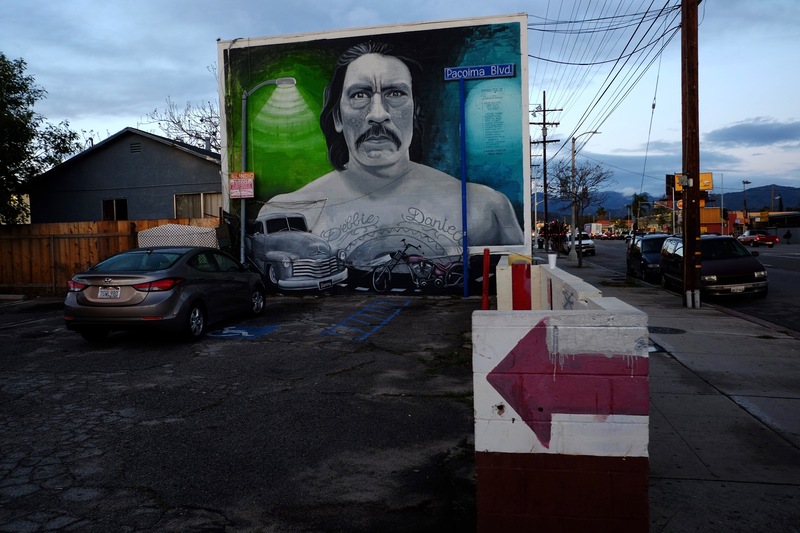 Artist Levi Ponce is the Michaelangelo of this district. El Niño, as we all know, is in town for a few weeks. He may pay up or he may skip town without leaving payment. Nobody knows. 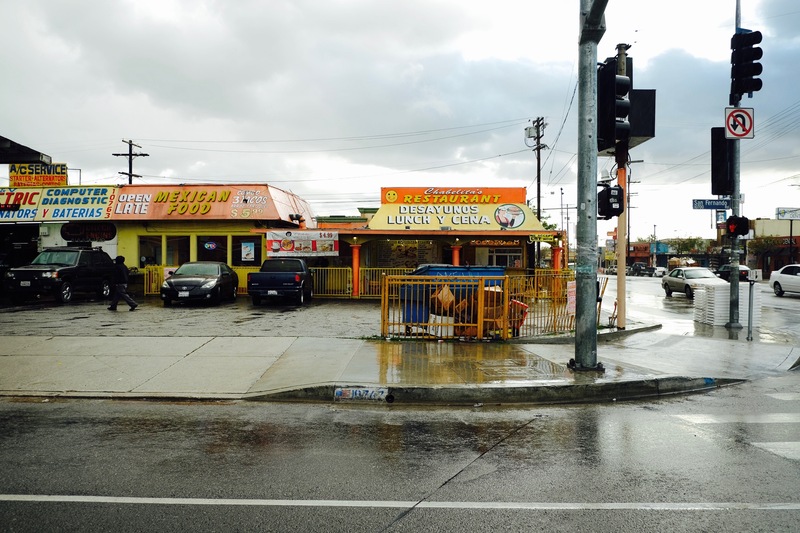 But Pacoima will carry on. Hi Andy, can you tell me where that little antique store is (last picture on the page?). That store is on San Fernando Road just south of Van Nuys Bl. 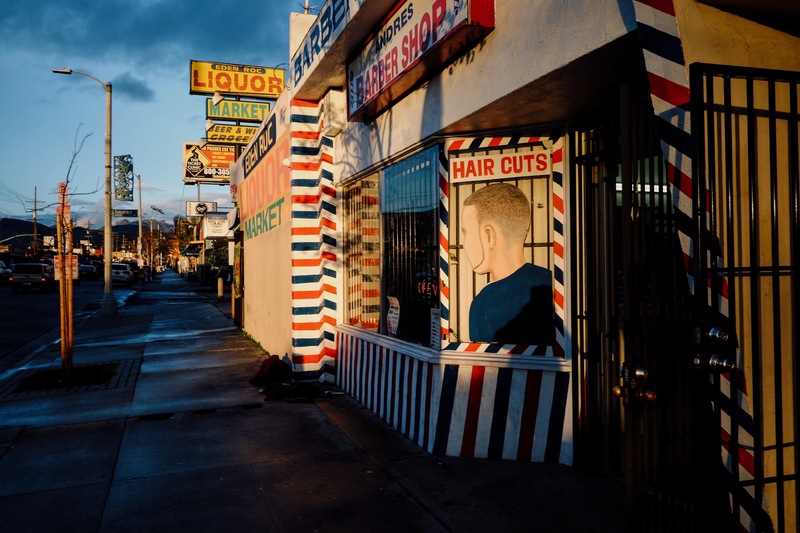 in Pacoima.